Today is the big day! My good friend, Peggy Frezon, just released the book trailer for her new book, Faithfully Yours, published by Paraclete Press​. Peggy is an amazing writer, and she was a very good friend of Sparkles the Fire Safety Dog​. She wrote a beautiful story about Sparkles. Faithfully Yours is a book full of true stories about how people love animals...and animals love people. All sorts of people---young and old, healthy and hurting. And all kinds of animals--dogs, cats, horses, rabbits, cows, chickens, parrots and even whales and deer. 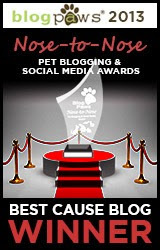 I am very excited and honored to be in her latest book, along with several of my furfriends. If unable to see the video, click HERE. If you like this video, won't you join in the Premiere fun and share it today? Post it on your Facebook wall, in a tweet or Instagram, or email it to some pet-loving friends? And if you really like the video, Faithfully Yours is available for pre-order now. As a Premiere BONUS, if you order Faithfully Yours on Amazon Smile (http://smile.amazon.com/ch/27-0932590) TODAY, leave a comment below to tell me you ordered, and a way for me to get in touch with you--or, send me an email--and I'll send you pawtographed bookplates you can adhere to the inside of your books as a thank you! When you order on Amazon Smile, a portion of the proceeds will benefit the Keep Kids Fire Safe Foundation! 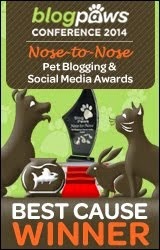 We also plan to have a give-away of a pawtographed copy, so stay tuned! Happy Book Trailer Release Day, Peggy! Learning about Fire Safety is Fun! We have the current dates and times available for the Keep Kids Fire Safe Foundation's fire safety Skype programs in 2015. Dates and times are filled once an application is received, on a first come, first serve basis. Times and dates will be going quickly since our Skype program is being promoted on a national level. You are welcome to submit an application at your convenience. Learn more about KKFSF's Skype program HERE. Please join Molly the Fire Safety Dog on Facebook. 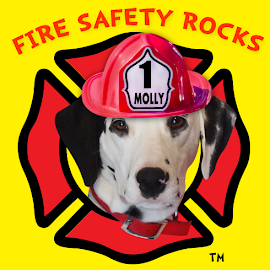 Join Molly’s App at “Molly the Fire Safety Dog” on your smartphone or tablet. Donations appreciated and accepted. http://www.keepkidsfiresafe.org. Episode 201 of the live-streamed children's safety show, "Safety Spot" LIVE from Sparkles' Clubhouse​ in Clarksville, Arkansas, USA. "Safety Spot" is the only and longest running weekly fire safety show on the web for children. During this episode, Firefighter Dayna and Molly the Fire Safety Dog shared how important it is to have a home escape map and practice your plan. 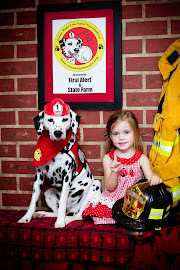 Join Molly the Fire Safety Dog on Facebook at https://www.facebook.com/mollythefiresafetydog. 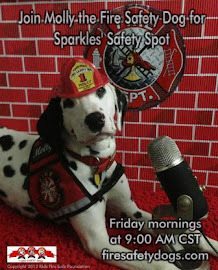 Firefighter Bo from the Little Rock Fire Department﻿ guest hosted Episode 149 of Sparkles' Safety Spot. Firefighter Bo shared some fun facts and you even get to see the special window prop that the firefighters from the department use when they teach fire safety! He also shares his fire safety tip for this week. So cool! Special thanks to Firefighter Bo for doing our show while we are in Nebraska sharing fire safety! 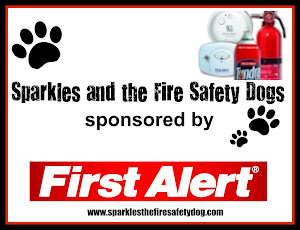 Brought to you by the Keep Kids Fire Safe Foundation﻿ and First Alert﻿.